Take control of your clinician's experience. In today’s fast-paced healthcare environment, every organization is seeking a way to manage the ever-increasing demands of regulatory compliance while minimizing the impact on clinician productivity. Delivering the best EHR experience to your clinicians is critical to their productivity, satisfaction and ability to deliver high quality outcomes. Cerner Advance gives you control over the clinician experience by bringing together advanced tools, expert analysis and a structured, repeatable process. Cerner Advance starts by comparing the efficiency and adoption of every clinician at your organization to their specialist peers across the country. This enables easy identification of outlier users or user groups spending significantly more time than their peers. Outlier identification then drives specific targeting by support staff within the Process Management framework. 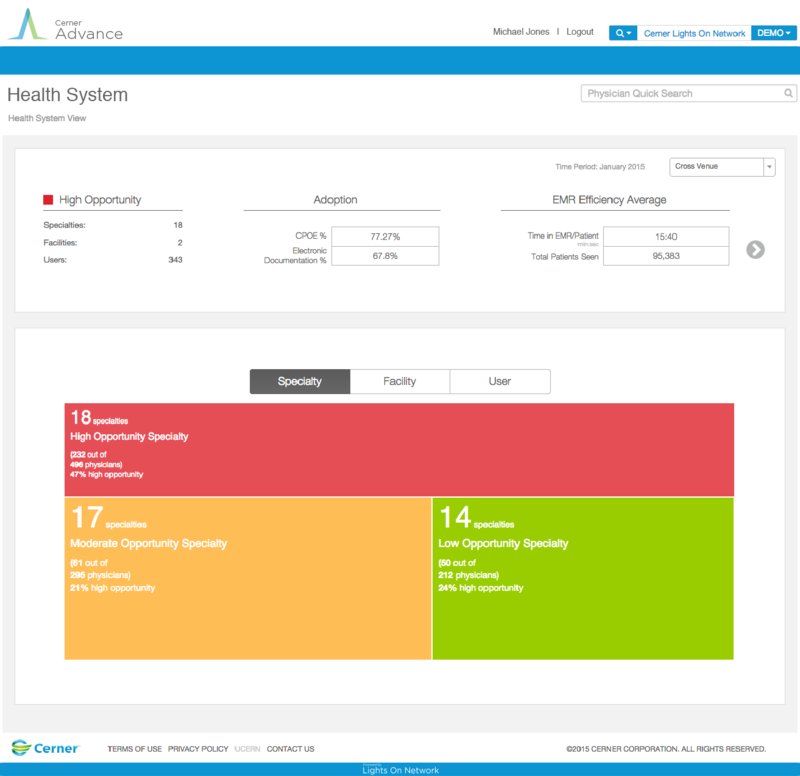 Cerner Advance enables users to understand the usage patterns and behaviors of targeted users and compare to that of efficient peers, both locally and nationally. Variance can then be used to create an action plan that IT, coaches, clinical informaticists leverage to drive change. That change could be in the form of personalized one-on-one coaching sessions. It could also drive the technical review of capabilities and configurations of the system, highlighting opportunities to improve through adoption of the Model Experience. Cerner Advance becomes your single, centralized tool for not just identifying opportunities to improve the user experience, but creating a plan for action and managing the delivery of that plan to your end users. This provides your organization the ability, with the right resources, to drive a data-driven process of continuous advancement of the user experience. Whether it's through your existing service agreements or cls-managed resources, you can be sure you're being effective and getting the most value out of the people and the work being done to support your clinicians. The overarching goal of the process, platform, and people is to make the clinician more adoptive, efficient, and satisfied with the EHR. Only by constantly measuring the progress towards those goals can you ensure success. Cerner Advance enables the progress measurement through integrated reporting that highlights operational efficiency and impact of the work done on the end users. 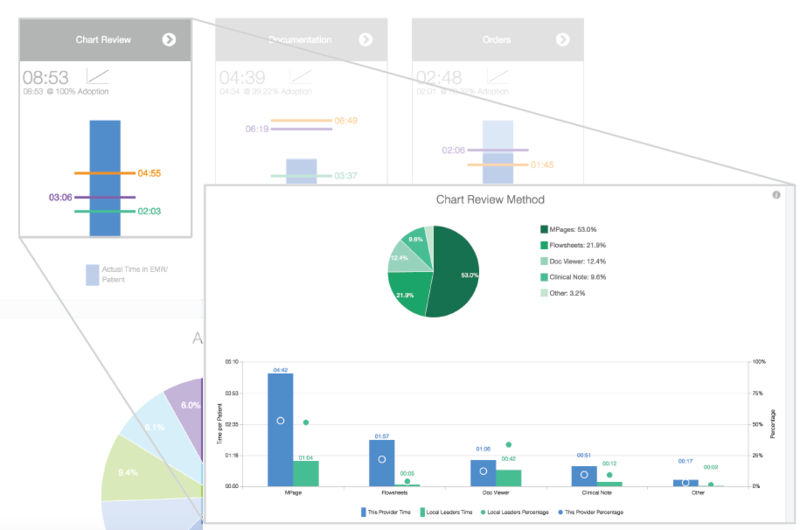 Below is an interactive example of the way Advance displays how an organization compares to its peers. Mouse over the colored boxes to see how Advance breaks down the specialties into opportunity groups. ©2019 CERNER CORPORATION. ALL RIGHTS RESERVED.